I hope that the title of this paper will have lowered any expectations that it will be a wide-ranging, comprehensive and contemporary consideration of the burning questions surrounding the multiple aspects of the debate on sexual difference. 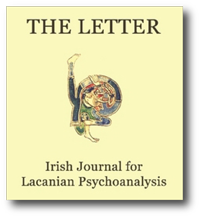 The very circumscribed nature of what I have to say comes from a style of working on Jacques Lacan that we have been engaged in at St Vincent’s Hospital in Dublin for the past twelve years. Our main interest is a clinical one. There is good reason for this because in many ways we are still at the stage that Freud found Charcot when he observed his presentations at the Salpetriere. Last Wednesday for example a man was presented at our weekly case conference who had developed a severe shake of the head after a relatively minor work accident some years ago. He had consulted neurologists in the United States, England and Scotland as well as in several Irish hospitals and had defeated their best endeavours. The only relief he obtained from this distressing condition was when his wife found and massaged a certain spot on his back but the success of even this procedure was, he admitted ‘a little erratic’! The work of the Bulgarian psychoanalyst, Julia Kristeva, provides an interesting parallel with the theories of both Freud and Lacan with regard to women. Her ideas on the formation of the subject; her theory of the semiotic and the chora; her views on the origin of poetic language and its relationship to psychotic babble; the maternal role and the abject; all of these seem very relevant to any attempt to understand the development of the female subject. Kristeva, a Bulgarian living in France, contends in an interview in 1989 that psychoanalysis offers a way to approach foreignness and alterity because ‘the Freudian message, to simplify things, consists in saying that the other is in me. It is my unconscious ‘.1 She claims to be ‘very attached to the idea of the woman as irrecuperable foreigner … (having) a permanent marginality, which is the notion of change’. Following Lacan, Kristeva maintains that subjectivity is formed in conjunction with language acquisition and use and she challenges the unity and claim to mastery of a sovereign subject. However, she focuses her analysis upon the transgressions of the law of the symbolic in the form of the semiotic, which she argues is an integral and revolutionary part of symbolic language.